It can be quite hard to find a specific dataset to use for a variety of machine learning problems or to even experiment on. The list below does not only contain great datasets for experimentation but also contains a description, usage examples and in some cases the algorithm code to solve the machine learning problem associated with that dataset. This is one of my favourite dataset locations. Each dataset is a small community where you can have a discussion about data, find some public code or create your own projects in Kernels. They contain a numerous amount of real-life datasets of all shapes and sizes and in many different formats. You can also see “Kernels” associated with each dataset where many different data scientists have provided notebooks to analyze the dataset. Sometimes you can find notebooks with algorithms that solve the prediction problem in this specific dataset. This source contains many datasets in different fields such as: (Public Transport, Ecological Resources, Satellite Images, etc.). 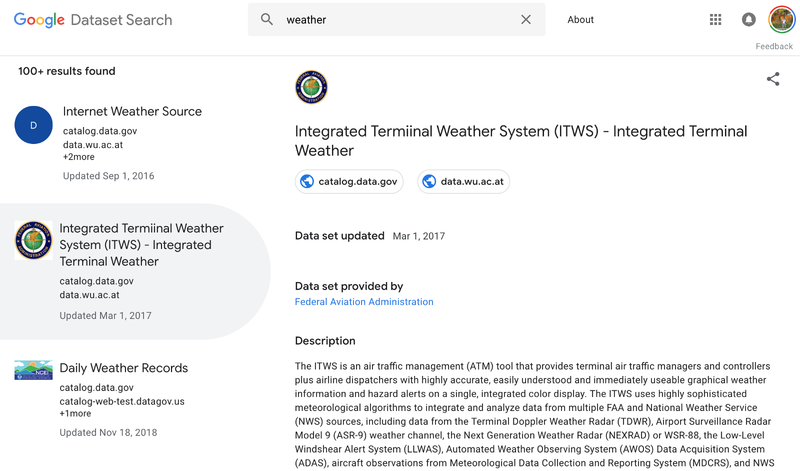 It also has a search box to help you find the dataset you are looking for and it also has dataset description and Usage examples for all datasets which are very informative and easy to use! The datasets are stored in Amazon Web Services (AWS) resources such as Amazon S3 — A highly scalable object storage service in the Cloud. If you are using AWS for machine learning experimentation and development, that will be handy as the transfer of the datasets will be very quick because it is local to the AWS network. Another great repository of 100s of datasets from the University of California, School of Information and Computer Science. It classifies the datasets by the type of machine learning problem. You can find datasets for univariate and multivariate time-series datasets, classification, regression or recommendation systems. Some of the datasets at UCI are already cleaned and ready to be used. In late 2018, Google did what they do best and launched another great service. It is a toolbox that can search for datasets by name. Their aim is to unify tens of thousands of different repositories for datasets and make that data discoverable. Well done, Google. It contains a data repository in the cloud dedicated to facilitating collaboration across the global research community. It offers a bunch of curated datasets that were used in published research studies. This is a great source of datasets organized by topics, such as Biology, Economics, Education, etc. Most of the datasets listed there are free, but you should always check the licensing requirements before using any dataset. EU Open Data Portal: European Government Datasets. US Gov Data (Not to get political, but this website is temporarily unavailable due to Trump’s Government Shutdown or “lack of funding” as mentioned on the main page). If you are working on image processing, computer vision or deep learning then this should be your source of data for experiments. Visual Data contains a handful number of great datasets that can be used to build computer vision (CV) models. You can look for a certain dataset by a certain CV subject such as Semantic Segmentation, Image captioning, Image Generation or even by the solution such as (Self-driving cars dataset). In conclusion, from what I observe, it seems like there is a global direction towards making more and more data available and easily reachable to the research and machine learning community. Those new datasets’ communities will continue to grow and make the data easily accessible so that the crowdsource and the computer science community can continue to innovate fast and bring more creative solutions to life. Sr. Tech Consultant @ Amazon Web Service. AI/ML Practitioner and Business Enthusiastic.